Oke-Ogun Poly Post UTME Form 2019/2020 and Registration Guidelines. 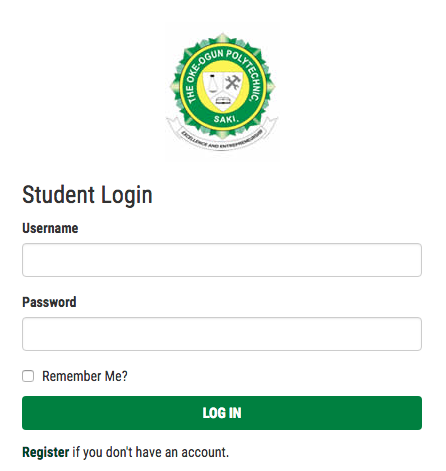 If you are searching for ‘Oke-Ogun Polytechnic Post UTME Admission form for 2019‘ This page is all you need. Explore. The management of Oke-Ogun Polytechnic wishes to notify all aspiring candidate that the ND post UTME admission screening form for 2019/2020 has been released. Interested applicant should follow the lead below for successful application. The minimum accepted cut off mark from each candidate is 120. This is to inform all the candidates seeking admission into The Oke-Ogun Polytechnic, Saki, various National Diploma (ND) programmes for the 2019/2020 academic session that the Post UTME screening exercise application form is now on sale. Oke-Ogun Polytechnic Post UTME Screening Eligibility. a. Candidates must have chosen Oke-Ogun Polytechnic, Saki, as their FIRST OR SECOND CHOICE. b. Candidates applying for the National Diploma Programmes must have attempted the 2019 Unified Tertiary Matriculation Examination (UTME) and obtained scores not lower than 100. How to Apply for The Oke-Ogun Polytechnic Post UTME. The price of The Oke-Ogun Polytechnic, Saki, post UTME form is N2,000 (two thousand naira only). Proceed to create and account and complete your application. You are expected to create an account on the portal on complete your application. DEADLINE: Application Deadline not specified. Bells University of Technology Courses and Requirements | Full List of Courses Offered.